Weekend was spent getting some new software to work...the same old story, a one-hour computer job required 2 days worth of mods. But did get some reading done. 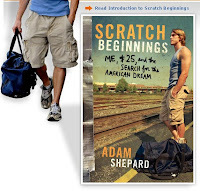 Scratch beginnings is a college student who, tired of the woeful refrain about the loss of the American Dream, set out to work his way up from a homeless shelter to owning a car, having an apartment and a salaried job. Haven't finished it yet, but it is straightforward, well-written, and as for the homeless shelter, why, Cow now feels as if she's there. Ugh. Was he really was called 'Scratch'? That makes his achievements all the better. Unless that was his occupation. There'd be a ready market for a scratcher in a homeless shelter. Easy to start from scratch when you know, deep down, there is someone out there to help you out when things get tough. Linda: agreed, though at least he IS trying to replicate the experience of those with no resources. Doghouse: yes, true. He graduated from college and set off to a town in which he knew no one, and tried to get ahead without using his college degree or any friends or contacts. It's an interesting book. He wrote it to refute Barbara Ehrenrich's book "Nickel and Dimed" about the hopelessness of working minimum wage jobs. He set out to prove that you could still achieve the American Dream, even coming from nothing.